SEO and SMO have been fascinating topics in the social digital sphere. Once perceived as separate influencers, the two when used together have become one powerful force. There may be some confusion for some on how they can actually work or if they actually can. Star Trek’s Kirk and Spock will help us discover how. The other night, my husband and true Star Trek fan, and I rewatched the movie, Star Trek Into Darkness. As I watched the main characters, Captain James T. Kirk and Spock work together on the Enterprise, the thought crossed my mind that this dynamic duo was very similar to SEO and SMO. When the two joined forces, their separate attributes complemented one another to reach their final objective. To clarify what SEO and SMO are, let’s review the definitions of what each one means. SEO or search engine optimization is the method of utilizing techniques and strategies to increase higher placements in search engine results and subsequently visitors to a website. SMO or social media optimization is the practice of using social media channels to increase the awareness of a product, service, brand or event and ultimately driving visitors to a website. Here are five definitive ways that search engine optimization and social media optimization are similar to Kirk and Spock. Like Kirk and Spock strategized throughout the movie, marketers need to have a solid strategy on how they will use SEO and SMO in concert. Having a solid Internet marketing strategy action plan is an important first step. The Star Trek dynamic duo had a decisive common goal of facing an adversary. Both SEO and SMO, although they are not facing a rival, have the fundamental goal of motivating an audience to ultimately visit a website to learn more about products, services, events or to inspire brand awareness. When the goal was defined, Kirk and Spock set out to engage the challenger by implementing their plan of action. As marketers, our challenge is to proactively engage and interact with our audience through social media and to place well in search engine results. The blended efforts of SEO and SMO are the Enterprise or vehicle to accomplish this. The combined quality of the skills and intellect of Kirk and Spock were apparent throughout the movie. Their unique personalities set them apart and captivated the viewing audience. In the same way, offering original and quality content to an audience through SEO and SMO efforts is critical to capture attention and set ourselves apart from the competition. When faced with the challenge, Kirk and Spock were focused on the end result. Our focus as marketers should ultimately be on the user experience. Google has been clear and it is worth repeating, “focus on delivering the best possible user experience on your websites and not to focus too much on what they think are Google’s current ranking algorithms or signals.” This focus should also permeate everything that we do in social media marketing. SEO and SMO: the next frontier. These are the new voyages of our marketing plans. Our mission: to explore new opportunities with the combined efforts of SEO and SMO, to seek new methodologies and new ideas, to boldly go where we have not gone before. 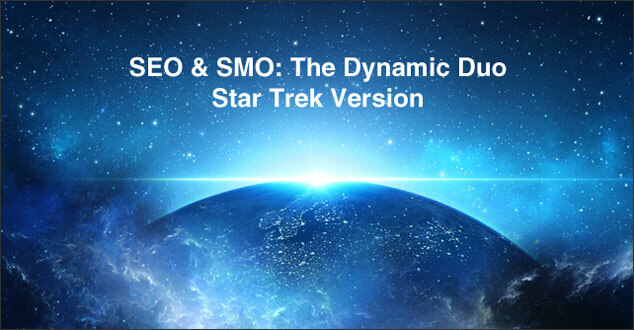 Can you think of any other ways that SEO and SMO are like Kirk and Spock? What is your favorite combination? We all love the Star Trek TV series and movies. Well, the 5 ways of SEO and SMO are spot on and in fact, the essentials of marketing and promotion. I just wonder if strategizing should come after you decide a goal. Of course, an action plan is very important and a lot of your success depends on it. It’s so true that the combination of SEO and SMO gives you great power to draw traffic to your site. Though I do not have great SEO, but I’ve seen this combination do its magic on some of my posts on my blog. I liked the mission statement that you created at the end. That’s being creative! It is great to hear that you are a Star Trek fan and that you like the analogy! You are right. Having the goal first is logical. Thank you for that suggestion! I love your similarity with SEO with Spock and SMO with Kirk! Very insightful. Thank you also for taking the time to read this and for you comment I hope you have had a great week! Love this analogy because I love Star Trek – the original series and the movies. I like the way you used the characters to describe what we, as marketers, need to be doing. I’m on the star ship and going strong with focus! I’m so glad to hear that you loved the Star Trek analogy! I think that I must have watched them all. I even gave the entire TV series on DVD to my husband one holiday. As for the SEO star ship, I am right beside you!